Jun. 21, 2013 12:00 p.m.
John Ware by Bruce Koch. A few weeks ago we wrote an article about Keystone and inadvertently included a photo of John Ware and his family. Many of our readers responded to both the article and the photo. Many wanted to know more about the family photo and the individuals. The photo was of John Ware and his family. 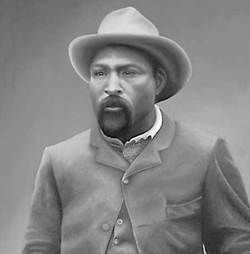 John was the first black cowboy to come to Alberta. He was born in 1850 near Georgetown, South Carolina as a slave on a cotton plantation. He was the second youngest in a family of eleven brothers and sisters and one of the biggest. There is a story of him stepping between the plantation owner and another slave, which may have been one of his sisters, and with a combination of his strength and humor diffused the situation, which saved his fellow slave from a severe beating. Another early story tells of the time the plantation owner asked Ware to break a horse and when he tried he was quickly thrown off. John could not escape the wrath of the owner and wore bull wipe scars on his back for the rest of his life, but it would be the last time a horse would ever throw him. By the time the Civil War had ended in 1865 John had grown into a physical specimen of over six feet and about 230 pounds with a keen sense of humor. After the war young Ware began to move about the country and drifted to Texas where he learned the basics of ranch work and horsemanship at a small ranch in northern Texas in the Fort Worth area. It was the time of the golden age for cowboys and when legends were born. John’s strength needed to been seen to be believed. Many a cowboy would tell stories of his ability to throw an eighteen month old calf on its back for branding, or how he would trip a horse by hand and keep it on its back while he shod the horse. Over time tales of his ability to eat huge amounts of food, his skill with a gun, and his riding ability coupled with his courage, strength, and sense of humor all added to the legend of the man called John Ware. Huge cattle drives were quite common and Ware was able to use his strength, good nature, courage, and remarkable horsemanship to get hired for a cattle drive that would eventually take him from Texas to southern Alberta by 1882. His first cattle drive started in Texas and ended in Montana where John found work, not on a ranch, but in a gold mine. The Northwest Cattle Company was looking for men to move 3000 head of cattle and 75 horses to Highwood Crossing, known today as High River. The Northwest Cattle Company would morph into the Bar U Ranch. John applied for a job and was hired by Tom Lynch. The drive began in late September and an early October blizzard separated a major part of the herd with John on his own able to keep his section of the herd together. When the ranch boss, Fred Stimson and the search party found Ware he was amazed at John’s ability to having kept the herd together and stated that in his belief no one else could have accomplished the feat. When the drive ended Stimson offered John a job and this would change Ware’s life when he decided to accept the offer. For the next six years John worked for the Bar U and Quorn Ranches saving his money and gaining a reputation as a great cowboy. From time to time cowboys working on ranches would challenge each other to feats of skill and horsemanship. During this time Ware would impress his fellow ranch hands with his riding skill where he never failed to ride a bucking horse, his use of a lariat, and his strength in wrestling steers. Fact is he pioneered steer-wrestling and in 1893 won his first competition at Calgary’s Summer Fair. These events would be the beginning of modern day rodeos and were the forerunner of the Calgary Stampede. Finally in 1888 Ware had enough money to begin his own ranch which he named the Four Nines and soon had a herd of 200 cattle. His spread was located on land near Millarville along the Sheep River southwest of Calgary. Ware proved to be a wise man as he made use of a creek that fed into the Sheep River to irrigate his land and always had a crop of hay for his cattle even during the dry years of the early 1890’s. On one of his trips into Calgary he was pleasantly surprised to see another black family and best of all they had a beautiful daughter! It is during his courtship that a story of both his strength and humor made the rounds. In courting Mildred Lewis John arranged to borrow a wagon to visit her family and take them for a ride in the country. As is common in the spring a storm came out of nowhere and the team of horses was struck by lightening and were killed instantly. It is reported that after John made sure no one was hurt he looked at the horses and said, “Now I’m going to have to break a new team” and proceeded to drag the wagon back to the Lewis farm unaided displaying both his sense of humor and strength. John married Mildred in 1892 and they worked together building the ranch along the foothills. By 1900 the herd had passed 300 in number and John’s reputation as both a great horseman and rancher began to draw more homesteaders into the area. So they decided to move away from the “sodbusters” and drove their cattle to a spot north of Millicent near the banks of the Red Deer River east of Duchess. Calgary sat between John’s old ranch and his new spread and it is reported that he waited until night to run his herd over a Calgary bridge and avoided the dangers of having to cross the Bow River. This resulted in Calgary passing a by-law preventing future use of Calgary bridges for cattle drives. In 1902 a major flood destroyed their home so John rebuilt their home five miles away from the Red Deer River near a creek that now bears his name. John and Mildred were very successful, as the herd had grown to over a 1000 head. As Ware aged his reputation as a good neighbor, an innovative rancher, and one more than willing to help in times of need grew far and wide. John and Mildred would have six children; three boys and two girls would grow to adulthood. In the spring of the year Alberta became a province Mildred died of pneumonia. In September, twelve days after Alberta became a province, John and one of his sons were checking the herd when John’s horse stumbled in a badger hole and as the horse fell, the man who was never thrown from a horse, fell and had his neck crushed by the horn of the saddle when the horse landed on him killing him instantly. Calgary saw the biggest funeral every held, at the time, the day John Ware was buried. In the eulogy the minister said that. “Every human skin is as beautiful as the person who wears it” and John Ware was a man with beautiful skin. Unfortunately none of Ware’s children had offspring and when his son Arthur died, at the age of 89, in May of 1989 the last of the Ware line came to an end. Over the years John Ware has been recognized for his contribution to the development of Alberta in a number of various ways. The province named Mount Ware after him in 1951. In 1968 the Calgary Board of Education, in his honour, opened the John Ware Junior High School. A creek in Kananaskis County was renamed in honour of Ware and established as a recreation area within the park. In 1998 Parks Canada decided to restore the Ware cabin and in 2001 it was opened to the public on its new site at the Dinosaur Provincial Park. In February of 2012 Canada Post issued a stamp in his honour as part of their Black History series. John Ware was a true pioneer and gained a reputation not for who he was but for what he was. It was built upon his deeds rather than words, of his courage and enormous strength, and for his respect for his fellow man. Over time stories have made him bigger than life and into a legend of the Old West.